Some days, nothing seems to go right. Maybe you were walking through the parking lot at the grocery store and tripped on a poorly repaired or neglected piece of asphalt, fell and sprained your wrist and broke your cell phone. Or maybe you are at work and slipped on water that was left spilled on the floor by the cooler and your lower back has been hurting for weeks. On a good day, falling down is just embarrassing. But what happens if you are seriously hurt? Before you sign anything or accept any offer made by someone who is responsible for your injury, call the offices of Joel J. Kofsky. We all want to believe that other people will do the right thing when we are hurt and it is their fault, but that is rarely the case in matters of personal injury. Slips, trips and falls are among the most common types of injuries experienced by Pennsylvanians, and these injuries can have serious consequences in terms of lost time at work, missed time with family and friends, serious medical conditions that can require surgery and even death. Unfortunately, many of these injuries are preventable and avoidable, but can be among the most difficult to prove in court. The top professional attorneys at Joel J. Kofsky can help determine whether legal action is appropriate in your case, and recommend that you contact the office immediately if you think your injuries could have been prevented. Ensuring that you get the appropriate compensation is extremely important for your long-term health and well-being. Unreported accidents are one of the most under-reported injuries that occur frequently. You don’t have to deal with a lifetime of pain. 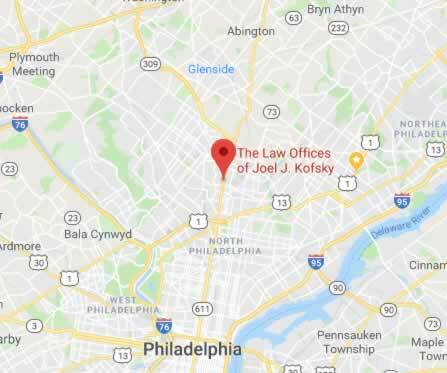 The offices of Joel J. Kofsky are ready to help get you back to normal and make sure you receive every benefit you deserve. Your injuries should not be taken lightly. Among all types of injuries, premises liability accidents are second only to motor vehicle accidents in Pennsylvania according to data from the Centers for Disease Control and Prevention (CDC). These injuries account for more in lost time at work than any other injury. Slips, trips and falls are a leading cause of injury-related accidental death in persons over the age of 65 and are the leading cause of death in persons over the age of 85. More than 8 million Americans visit emergency rooms each year due to injuries from slips, trips and falls. The CDC and the National Safety Council (NSC) report that 34,673 Americans died at home and work from slips, trips and falls in 2016, continuing an increasing trend of Americans being severely injured and killed in preventable accidents. Slips, trips and falls that are not work-related fall within a category of personal injury law called premises liability. Premises liability law works under the assumption that persons responsible for property have a duty to prevent hazards that can cause injury. This can include safe walkways, stairwells and other structural obstacles, landscaping, and even water or other potentially slippery substances being allowed to create dangerous conditions. Premises liability complaints can involve more than one defendant if it can be shown that multiple parties held a duty to ensure safe conditions. Defendants can be individuals, businesses, organizations and municipalities depending on the nature of the injury and the location where the injury occurred. Failure to remove water, ice and slippery substances from floors and walkways. Failure to correct bunched, wrinkled carpeting and rugs. Failure to warn of hazards that might not be obvious, such as holes in the floor. Failure to correct broken sidewalks, parking surfaces and walkways. Failure to safely stack and store items that can fall and injure. Failure to remove obstacles from walkways, doorways and stairwells. Failure to provide proper lighting. Willful disregard for known danger. Certain activities that are inherently dangerous, such as off-road driving. Drifted or piled snow in which there has not been time to remove. Pennsylvania also applies a “comparative negligence” standard to premises liability cases. Comparative negligence means that the courts will determine how much responsibility the defendant had for their safety, and how much “at fault,” as a percentage of total responsibility they are. If the court determines that the defendant is more than 50 percent responsible for the injury, no damages can be recovered. Some personal injury cases can be very complex and many of the laws in Pennsylvania are nuanced. It is best to contact a personal injury attorney as soon as possible to make sure your rights are protected. The statute of limitations for your slip, trip and fall lawyers to file your case in Pennsylvania is two years. Slips, trips and falls that result in injury while at work fall under Worker’s Compensation law in Pennsylvania. In 2015, 36 Pennsylvanians died due to slips, trips and falls at work according to data from the Bureau of Labor Statistics (BLS). This accounts for 21 percent of all worker fatalities in the state and is second only to transportation fatalities. Nationally, 229,240 employees missed time at work due to slips, trips and falls. Worker’s compensation claims “arise out of employment and occurring during the course of employment” (AOE/COE). Generally, if you are injured or made ill at work, you are eligible for benefits, but like personal injury cases, the law is complex and seeking a top worker’s compensation lawyer is advisable to ensure you get the appropriate benefit and care. A major difference to personal injury law is that the defendant is not required to show negligence on the part of the employer, making these cases easier to argue in court. This does not mean that you should settle your worker’s compensation claim on your own. 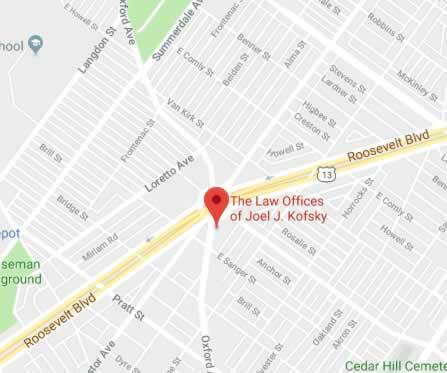 A highly trained and experienced attorney, such as those with the offices of Joel J. Kofsky will know the intricacies of the law and be able to ensure you get a fair and just settlement that protects you, your family, and your long-term health care needs. Worker’s Compensation law prevents an individual from suing their employer directly due to work-related injuries. Employers are required to maintain Worker’s Compensation insurance and claims arising from work-related injuries are handled by the Pennsylvania Department of Labor and Industry. The Occupational Safety and Health Administration (OSHA) maintains regulations employers are required to follow to keep employees safe. Many of these regulations are straight-forward and common sense, but due to a variety of reasons, safety can be overlooked and employees can be in danger. Generally, injured workers who retain an attorney to handle their Worker’s Compensation claim receive higher award amounts and typically secure more substantial, long-term health care benefits. Attorney-represented plaintiff’s will normally see quicker completion of cases with less stress. It’s a pretty typical slapstick comedy routine — someone slips on something, like a banana peel, and falls flat on their face. It’s been used for comedic relief in cartoons and movies, but when it happens in real life, it is not funny at all. In fact, slipping and falling on a wet floor can be extraordinarily painful and result in serious injuries that could cost you thousands of dollars in medical bills. Slipping and falling on wet floors is even more common than tripping down stairs or on curbs. The one place that this happens the most is in grocery stores, where the likelihood of spills or wet floors from cleaning can provide slipping hazards. Mall owners also have to pay careful attention to slippery floors, especially in food courts where people frequently spill, where clean ups with liquid chemicals often occur, and where customers walk in from rainy or snowy weather and track water across the floor. Wet floors are also frequently found in retail stores, restaurants, your place of work, hospitals, and nursing homes. You have the right to seek legal action against the owner of a store if their negligence caused you to slip and fall on their wet floor. The law of premises liability dictates that they are responsible for maintaining a safe environment, which means cleaning up spills, drying the floor after cleaning, and/or warning customers of any wet places on the floor. In fact, by pursuing legal action, you could be preventing that owner from causing anyone else to get hurt. The costs to cover your medical procedures after you’ve been injured in a slip and fall accident can be very expensive, and they can add up and continue long after you initially go to the hospital. Aside from immediately surgery or medical care, you may have to keep taking medicine or attend physical therapy for weeks or even months. In some cases, you could be permanently disabled from your fall. Many injuries from slip and fall accidents also mean that you cannot return to work. If you’ve broken a bone or suffered head trauma, you could be out of work for weeks and unable to earn a wage. If you are permanently disabled, you may not be able to return to work for a very long time. This makes the burden of medical bills even worse. The best way to go about proving that the negligence of the store owner caused your slip and fall accident is to work with an experienced attorney who has handled these kinds of cases before. Our lawyers will work with you on your unique case. They will look at safety records of the store, cleaning schedules, maintenance reports, video surveillance, and even witness testimony to determine if the owner knew about the spill or the wet floor and did nothing about it. Another angle your lawyer will investigate is what the flooring itself is made of, because property owners can even be held responsible for slip and fall accidents if their flooring is not safe, is untreated, or is more prone to be slippery. Many owners will treat their flooring with a non slip treatment, but if they do not, they could be responsible for falls if the flooring is too slippery or has no support rails. If you slipped and fell in any public place, call a slip and fall attorney right away to determine if you have grounds to pursue legal action against the store or property owner. By receiving financial compensation, you will be able to cover your medical bills, your lost wages, and any pain and suffering you experienced. It likely was not your clumsiness that caused the accident, so give one of our attorneys a call so that they can begin looking at your case today. Any building that has more than one floor is going to have a staircase, elevator, or escalator in the building to help people get from one floor to another. We all have to use these quite frequently, in some cases every day if you live or work on a higher floor. We usually use them without thinking that they could be dangerous, but all three are locations where slip and fall or trip and fall accidents occur with some regularity. Furthermore, people that do fall down stairs or escalators or in an elevator assume that the fall was their fault because they were being clumsy. This is not always the case — the fall could just have easily been the result of the property owner failing to keep them safe and in good repair. With the assistance of an experienced Philadelphia slip and fall lawyer, you might even have a case against the property owner in regards to your accident. Because of premises liability laws, property owners are responsible for maintaining a safe environment on their property, which includes staircases, elevators, and escalators. Staircases need to be evenly built and free of clutter, and elevators and escalators require regular maintenance and inspection so that they are safe to use. Owners also need to be careful about how they clean these surfaces, because wet or waxy floors could lead to slipping and falling. If the owner knew about a hazard and did not have it fixed property or did not warn people of the hazard quickly, they could be held responsible for any accidents that occur. Staircases are prime places for people to trip or slip if they are not maintained properly. Things that owners and pedestrians need to watch out for include loose or uneven carpeting in stairwells, worn out wood in old staircases that could be slippery, or polished tiles that are left untreated. Weather can also be a huge liability when it comes to staircases: if people track in snow or ice, or even rain water, the surfaces of each stair could be slippery and could cause people to fall. This is made worse if the owner has failed to install a handrail for the staircase or the handrail is loose or uneven. These are required by building codes and could get the property owner in trouble if they are not installed or maintained properly. Steps also must be even, meaning that they must be level across each step and each step must be the same height. Building codes in the area outline the maximum width and height allowed for each individual stair, and if the stairs exceed those measurements, the property owner could be held responsible for accidents that occur, even if the measurements are off by only a quarter of an inch. Slip and fall accidents in elevators most often occur because of the surface used for the floor of the elevator. If the floors were cleaned or waxed and left slippery, people could easily slip and fall while getting on or off the elevator or simply while riding it. Loose or lumpy carpeting can also cause people to trip. But elevator accidents can include more than just a fall. An unmaintained elevator can go too fast or not stop in line with the floor its on, meaning that people trip when leaving the elevator. In fact, over 17,000 people are injured each year riding an elevator, and around 30 people die every year riding an elevator. These serious cases happen when the elevator stops far from the floor itself, causing serious falls. The building owner could be responsible for the elevator malfunction if they did not ensure that inspections and regular maintenance occurred, but it could also be the fault of the elevator manufacturer for building it incorrectly. The company that performed the maintenance could also be at fault if they did not do their jobs properly. If there was an issue with an elevator that caused your accident, someone is liable for it, and your lawyer will help determine who owes you compensation for your accident. Anyone who has ridden an escalator knows that they can be tricky to get on and off of, even if youve done it a hundred times. You have to be careful to watch the escalator and where you step, or you could miss your step and fall. Some escalators are even known to be jerky, which can cause problems even after youve boarded the escalator. Also, clothing such as shoelaces or even sleeves can get caught in the escalator steps or handrails, which can lead to injuries as well. Across the United States, people take around 60 billion trips up and down escalators every year. Of these trips, around 11,000 accidents occur on escalators. Around 3,000 elderly people are hurt in these accidents. Because accidents on an escalator can be extremely dangerous, given the fact that the steps have sharp edges and that victims can fall a long way before stopping, courts are beginning to hold property owners to a higher standard when it comes to maintaining the safety of their escalators. This means that they could be considered legally responsible for your injuries and could owe you compensation for your injuries. If you have fallen on an escalator, be sure to contact our offices as soon as possible to begin pursuing a claim. Parking lots can be some of the most dangerous places to drive anywhere. Cars are fighting for spots, and some back out to leave without looking to see if any vehicles are approaching. Tight turns and tight spots just magnify the danger. The hazards don’t end once you park your car, either. Once you get out of your vehicle to enter the mall, your workplace, the dentist’s office or any number of destinations, you are trusting that the owner of the lot, either outdoors or in a garage, has adhered to basic safety rules. There is absolutely no guarantee, though. Suits are filed all of the time by people who exit their vehicles and try to get to a given building, only to slip and fall on the pavement or coating that covers that pavement. If you have slipped and fallen in any sort of parking lot, don’t hesitate to contact a personal injury lawyer for help to get the compensation that you deserve. No car parking lot is a neutral space—it is always owned by someone or something, and the owners are required by law to keep that lot in a safe condition. Premises liability is a frequently cited area of law by a car park slip and fall lawyer who make sure that justice is done for their clients. • Oil, gas and other liquids sometimes cover already-slick surfaces in car parking garages. Many pedestrians have slipped on these slick surfaces. • Inclement weather adds another dimension to car parks, both inside and out. Parking garages are usually open air, so rain, snow and ice can appear unexpectedly on their surfaces, especially on the outer edges of such garages. Outdoors, obviously, any car parking area needs to be cleared of snow and ice continually to ensure pedestrian safety. In many cases, contractors are hired to keep such lots clear of snow and ice, but during major storms, they might have a difficult time keeping up with all of the lots that they are responsible to clear. Rain, snow and ice have caused many a pedestrian to slip and fall in parking lots. carefree walk from vehicle to office. These slip and falls might appear humorous at first, and perhaps you have slipped and been so embarrassed that you have not told anyone about it. There is nothing funny about the types of injuries that you can suffer while slipping in a car parking area. Here is a brief list of the types of injuries sustained in just one city in recent months. therapy, with huge costs involved. • Soft tissue injuries in the wrist, fingers, back and legs, such as if a pedestrian tried to catch herself and sprained several body parts in the process. These can heal with time in most cases, but fractures and breaks can also occur, necessitating casts and even surgeries to make sure that bones heal correctly. • Sprained ankles and knees are a common result of slip and falls in car parking areas. The most severe cases can force a person to miss months of valuable work time and wages. • Broken bones in the face, concussions and skull fractures can result when a person hits head first after slipping and falling. Expensive surgeries are needed in some cases, and concussions might require months of missed work to regain one’s balance and end the headaches that commonly occur. Neck and shoulder sprains and fractures also occur regularly when pedestrians slip and fall. Some of these injuries might not seem serious, but many lawsuits have netted victims up to a half-million dollars to compensate them for their past and future medical costs, their lost wages at work, and even pain and suffering. If you have slipped and fallen in a car park of any type, don’t hesitate to contact a Philadelphia slip and fall lawyer to see if you have grounds for legal action. A strong personal injury lawyer can take on the biggest corporations that own car parks and make sure that an insurance company does not give you a sub-par settlement. Don’t agree to any settlement or other type of deal with the owner of the car park that you frequent before contacting a Philadelphia Slip and Fall Lawyer. Your slip in the parking lot was not your fault, in most cases, and you can help to make that public space a safer area by holding its owner accountable under the law. Should I file a Lawsuit for my injuries ? Many people slip and fall every day, so do not think that you are alone. Also, do not be afraid of how you are going to handle the medical bills you have incurred from treating your injuries. In many cases, you can take legal action and even receive compensation if you enlist the help of an experienced slip and fall attorney. Many people find that they do have a case even if they initially did not think they did, so do not be afraid to get in touch with a lawyer and find out what your options are. Although there are certainly some slip and fall cases that occur in peoples homes, there are hundreds of thousands of slip and fall cases that take place in a public location, like a store, mall, sidewalk, parking lot, or staircase or escalator. Almost three quarters of slip and fall cases occur on flat surfaces that have not been properly taken care of. Many of the incidents that occur in public places could have been prevented if the property owner had been more diligent. Any time you are walking in a public place, you have the right to expect that you can walk safely without the risk of injury. The owner of the property or the party responsible for the public place is often subject to premises liability, meaning they must maintain a safe environment. This also includes walking around your place of work. Because of this, you can often obtain compensation for your injuries if you were hurt walking in a public place because someone did not take care of the surface properly. In serious cases where there is a death, family members can also obtain compensation for their loss. Nursing homes. Not every fall in a nursing home is the fault of the elderly patient. If the floors and stairs are not taken care of in a way that makes it safe for the patients to walk, the home could be held responsible for the slip and fall. Grocery stores. Because of the greater possibility of spills and the fact that many stores do not clean up spills promptly, grocery stores present a great risk for slip and fall accidents. Restaurants. As another location prone to spills and busy staff members who do not clean them up quickly, restaurants can also result in slip and fall accidents fairly regularly. Construction areas. The clutter that construction workers often leave behind can result in accidents. Blocked or cluttered staircases also pose a similar threat. Retail stores. Uneven carpeting or flooring, often the result of wear and tear, can result in people tripping and falling. Some retail stores also have step ups between departments, which can cause trips if they are not marked properly. Parking lots. Not only are parking lots notorious for being unevenly paved, they can also be dangerous in bad weather if they are not treated correctly to protect against snow and ice. The cost of slip and fall injuries can be massive. In fact, an average slip and fall case results in around $23,000 in medical bills. This is a huge financial burden to bear if the accident was not your fault, and having a skilled Philadelphia slip and fall attorney on your side is the best way to begin taking legal action against the responsible party and receiving the compensation that you deserve for your injuries. There are several ways to prove that the property owner or the business owner was at fault for your slip and fall accident. By demonstrating that the owner either knew about the dangerous spot on the property and did not fix it, or that they did not properly warn people of that danger, they could be held responsible for any accidents that occurred as a result of that unsafe environment. This often occurs if the business or property owner does not perform regular inspections. Your attorney will be able to access the records and documents necessary, as well as any additional evidence, to prove that the owner was at fault. A temporary condition, such as bad weather or a spill, must be legally addressed within a certain time frame that is considered reasonable or the owner will be considered liable. Your lawyer will be able to determine how long a reasonable time frame is. A permanent condition, like uneven flooring, needs to be taken care of by the owner. If months go by without it being fixed, the owner is responsible for any resulting accidents. Proving negligence on the part of the owner could mean compensation for you for your injuries. The injuries that result from slip and fall accidents can be very painful and in some cases very serious as well. These injuries can include broken bones, fractures or sprains, cuts and bruises, concussions, or head or spinal injuries. Some of these injuries can turn into worse problems as well as remain painful for a long time. These injuries can also often cost a lot of money to be fixed, which makes the compensation you could receive from the owner even more important. Do not assume the accident was your fault. An experienced Philadelphia slip and fall lawyer can help determine that the owner was at fault and help you receive compensation to cover the medical costs from your injuries. Furthermore, by ensuring that the property owner is punished, you could be saving other people from also falling and hurting themselves on the same spot. Do not hesitate to call our offices and begin working with an experienced attorney on your case. Drug and alcohol use at work. Committing a crime at work. Driving to, or going home from work. Falls at work account for the most severe injuries and fatalities nationwide behind transportation accidents. The CDC considers slips, trips and falls at work to be 100 percent preventable through proper adherence to safety procedures and awareness of dangerous situations. Still, these injuries account for an average of 12 days of missed work per injury, the highest of any type of work-related injury. The National Floor Safety Institute claims that slip and fall injuries are the most common worker’s compensation claim filed and are the primary cause of work-related injuries to employees over the age of 55. The CDC notes that five percent of workers over the age of 55 who experience a fall at work suffer a fracture which can lead to long-term permanent health challenges and even death. Many companies will attempt to settle worker’s compensation claims quickly. While it may seem they do this because they want you to be healthy and taken care of, most often this tactic is used to prevent costly litigation. Unfortunately, it is costly litigation that forces businesses to make changes to the safety practices they employ. All too often, businesses that allow workers to be injured do not change practices until forced to do so, leaving countless workers nationwide exposed to potentially serious and life-altering injuries. Having a highly competent attorney to represent you in your worker’s compensation case may prevent someone else from suffering the same injury or worse. Pennsylvania law allow three years from the date of injury to file a worker’s compensation claim. Injured workers who choose to wait to file are likely to lose benefits and ultimately, may lose the case. Contacting an attorney at Joel J. Kofsky Law immediately ensures that you are represented by top attorneys from day one. Many worker’s compensation claims are rejected when initially filed. This tactic is often used to dissuade workers from filing claims by requiring additional effort to pursue the claim. If your claim has been rejected, it is highly important you contact the offices of Joel J. Kofsky immediately to preserve the benefits you are legally entitled to receive. When you are injured, taking care of your health and getting back to normal should be the only things on your mind. Worker’s compensation suits can be stressful and time consuming to handle on your own, and much of the legal language is confusing. 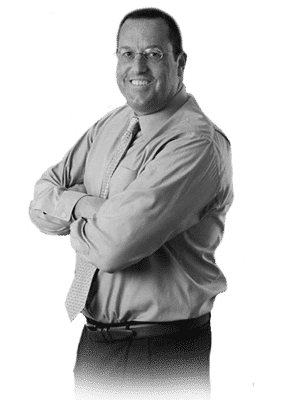 Letting the professional attorneys at Joel J. Kofsky handle your claim will take away the stress, letting you get back to being healthy as soon as possible, and will ensure that the benefits you receive are adequate for your injury. Do I need a personal injury lawyer ? In short, Yes! Almost every injury victim can benefit by retaining the best accident lawyer available. But not every injured person will have a valid claim against another party. It is complicated to know if the circumstances that led to your accident, and your injuries, are the basis for a valid claim. Do I have a Claim ? For a claim to be valid, you must establish that your injuries were caused by the carelessness of others. This is important because for a personal injury claim resulting from a slip and accident to be valid. Under Pennsylvania law, you will need to prove that a slip, trip and fall injury happened due to an unsafe situation that should have been corrected by the property owner or an employee. This is often referred to as the “reasonable person” standard. Essentially, the courts will examine whether a reasonable person would have identified the hazard and had time to correct it before the accident occurred and did not, or if the property owner caused the hazard and reasonably should have identified it as a potential hazard likely to cause injury and did nothing about it. The courts will use the term “negligence” for the first scenario, and “gross negligence” for the second. What Is premises liability all about ? The laws that govern premises liability are important to know any time you enter onto property that is owned by someone else, whether it is a business, an apartment complex, or a nursing home. Premises liability means that whoever owns the property is responsible for making sure that the environment is safe for everyone. This means cleaning up spills on the floor; maintaining safe escalators, stairs, and elevators; and putting up appropriate signs when there are any dangerous areas. Under premises liability law, if the owner does not follow these rules, they could be held responsible if someone is injured because of a hazardous area on their property. One particular area that premises liability can come into play is in areas like airports, casinos, hotels, and amusement parks. Because of how busy they are, there are often spills or other hazards on the floors that are not cleaned up very quickly and can cause people to slip and fall. These slips can result in injuries like broken bones, bruises, or even head injuries. These properties must also maintain their stairs and escalators, because they could also pose hazards if they are not taken care of. Airports, casinos, and hotels must also have appropriate security to take care of their clients or they could be responsible for anything that happens that could have been prevented by security. Amusement parks have even more dangers present than other public places. Although rides are supposed to be tested very carefully for safety, but sometimes even if the first tests come back with no problems, issues could arise after the ride has been in use for a while. This could lead to some really serious injuries for riders if the ride malfunctions. In these situations, the owner of the amusement park is responsible for those injuries, because they are responsible for the safety of the amusement park rides. The same rules apply if someone drowns or gets hurt at a pool at an amusement park if the lifeguard failed to do their job. Premises liability cases can also arise in many other locations. Another common place for premises liability cases is at your childs day care center. If something happens to your child while they are in the care of the day care center, we will represent you and make sure the center is held responsible. Some potential dangers at day care centers include unsafe or recalled cribs or playground equipment, lack of proper attention and care, or bedding that is too soft which can lead to suffocation in young children. If something has happened to your child because of negligence on the part of the day care center, call a Philadelphia premises liability lawyer as soon as possible. Many people do not know that premises liability can also apply to cases where a neighbor or someone elses dog bites you. In some cases where a dog bites someone, the owner could be at fault for not training the dog properly or for not keeping it restrained well enough when they knew it could be dangerous. Unfortunately, over four million people are bitten by someones dog each year, and many of the people bitten by dogs are children. Although dogs are often perfectly safe, it is extremely important that you treat unknown dogs with great care, because even normally friendly breeds can bite or maul people. Your dog bite lawyer will assist you with your case by helping determine if the dogs owner can be held responsible for the dog and for any medical treatment you had to undergo for the bite or the scratches. If you have been hurt in an accident on someone elses property, or if it has happened to someone you love, you need the assistance of an experienced premises liability attorney. Their knowledge of the law will help determine how the property owner was at fault for your accident, especially in cases where it is unclear. Any time that the owner was aware of a hazard and did not fix it or warn people about it, they can be held responsible and liable for your injuries, and you can receive financial compensation for your medical bills. Call our offices as soon as possible to begin working on your case and get the compensation you deserve.